"It's a group that encapsulates basically everything that is wrong with society." Brilliant. Just brilliant. A leftist's version of Palin-speak. In Oakland, Calif., shipping companies and the longshoremen's union agreed to send home about 150 workers, essentially halting operations at two terminals. In Longview, Wash., workers were sent home out of concerns for their "health and safety." 17 Occupy Wall Street protesters were arrested and charged with disorderly conduct and trespassing in downtown New York City, a police spokeswoman tells msnbc.com. The protesters were targeting Goldman Sachs, which has stakes in some port facilities and which Occupy says has been trying to undermine trucker and longshoremen's unions. Oakland, Calif.: Tractor-trailers en route into the facility, the nation's fourth busiest container port by volume, were backed up and idle at one entrance where protesters formed a picket line in front of police. Two longshoremen who spoke to Reuters on condition of anonymity outside the gate said they would refuse to cross picket lines to get to their jobs and assumed others would follow suit. Long Beach, Calif.: Activists scuffled in the rain with helmeted police officers who shoved them with batons in an effort to keep the entryway clear. At least one protester was taken away in handcuffs after the skirmish, and demonstrators later left the area to block traffic along a main thoroughfare through the port. But as rains grew heavier and police converged in force threatening arrests, protesters began to disperse on their own. Portland, Ore.: Motorcycle police confronted some 200 demonstrators who tried to disrupt traffic outside a terminal there. Officers later stood aside and let protesters march to the terminal entrance. The port said two of its four terminals were closed for the day due to security reasons and that 200 workers were told not to show on Monday. "The objective of the day is to shut down the port through mass action," said Mike King, a graduate student who acts as a media liaison for Occupy Oakland. "The Occupy movement is attacking the 1 percent at their point of profit." Good job idiots! You have effectively kept 200 middle class blue collar workers from their jobs. They will not be paid as a result of your stupidity! And just in time for the holidays as well. The businesses that lose some revenue today because of your actions will not feel this shut shut down. The average worker who loses a days wages will. When will you idiots get it through your head that this type of protest is only further hurting those thay you claim to represent. Hey I am all for the Occupy movement but they absolutely do need to pull their heads out their asses. This port shut down scheme was moronic idea and will play quite well for all the wrong reasons on Fox and Friends, Hannity, and O'Reilly. Yeah, as much as my heart and local action is in this movement, This is just dumb. My first suspicion is that this dude took a freaking bribe to set up a reactionary game field. Surely the Oakland population is plenty smart enough to have the capacity to see past the ends of their collective nose...and find better strategists than this. Wow. Thanks to BB and Charles. I really expected some backlash on this, so I'm pleased to see some agreement - at least for now. I think it's stupid beyond belief and it can only hurt the movement. In the meantime, they need to find a better media spokesman. Good grief. I agree with you. I heard about a similar lurch into stupidity by Occupiers in Seattle -- disrupting traffic and thus harassing ordinary commuters. None of this stuff at all targets or even inconveniences the upper 1% they claim to be protesting against. It's pure bullying of ordinary people. Part of the problem is that the movement is so leaderless and amorphous that it has no control over who goes out and acts in its name. The bullies and idiots can take over, if they appear in great enough numbers. I suspect the Occupier movement will bifurcate. Those who are willing to take guidance from unions with political experience will become more coherent and make a real contribution as we head into the election year. Those who won't, or who just want to make a ruckus, will become more and more unfocused and unpopular and eventually fade away. Protests that don't cause disruption and inconvenience for the masses are protests that no one hears about. I would take the mainstream media's position with a large dose of cynicism. Jayne's KOS link gives a more nuanced view of the port workers and their situation. As the six truckers point out, theirs is not a simple problem—and has much to do with the rapacious behaviour of corporate America. They also took pains to identify with the Occupy group, which in of itself speaks volumes. From the Occupiers' POV, one would have to say, "you'd have to be here." The original Occupy Wall Street protest caused little or no disruption or inconvenience for the masses, but everybody heard about it. The Occupy protest I went to in Portland didn't harass anyone and it attracted plenty of attention. The Occupy movement claims to be working on behalf of the 99% -- the masses. Harassing the very people one claims to represent is the royal road to irrelevance. More to the point, this protest did not inconvenience or affect its claimed target in any way. It was purely harassment of working-class people. Nothing else. It doesn't really even qualify is a "protest". @Infidel (1st comment): I totally agree with you about the cause and effect of a leaderless movement. Speaking from experience in the good ole days, we had monitors around the parameters to not only look out for nasty Klansmen types eager to start a fight (at which point we'd alert the cops), we also tried to keep marchers calm and focused (and to make sure they obeyed the law). There is nothing more impressive or powerful than a few hundred or thousand protesters marching along quietly (mostly) except for the singing of songs. Yes, there was chanting and yes, Chicago was a total police riot, but basically it was passive resistance and peaceful protest that sent a loud and clear message. @Jayne: Thanks for the link. I read the article and linked to their FB page and then to their web site where I read their article in full. I'm pretty familiar with the deplorable conditions under which these people work and I'm in total sympathy with them - and have been for a long, long time. But I still think Occupiers may be going down a slippery slope by going off on tangents unrelated to the original complaints. A lot of Americans get it about the big banks. I'm not sure they'll get it when it directly keeps hard working people from doing jobs they so desperately depend on. I think it's a bad tactical error and bad PR. @JC: Well, my good friend, it looks like Infidel took the words right out of my mouth in his response, so rather than be redundant, I'll just say a measly, "Ditto." @TEC: Part of my response to you is contained in my response to Jayne. According to the article, "Their take doesn't offer a clear yes or no to support for today's action." I gather from this that they weren't actively participating, so I can see why the MSM may not have mentioned them. I guess I just don't get how preventing blue collar workers from working, tying up traffic, and harassing people, etc., can be a bold strike against corporate America. I assume you were "here"? NOTE: The MSNBC is being updated on a regular basis. @TEC: Meant to include a wink at the end of my last sentence, so you wouldn't think I was being totally snide and snarky. ...protests that don't cause disruption and inconvenience for the masses or result in excessive police violence and/or extreme injury or death of protesters are protests that no one hears about. I'd rather see inconvenience than death, but hey, that's just me. "Occupy Wall Street protests spread to U.S. West Coast ports as demonstrators tried to halt shipping operations and cut into profits at Goldman Sachs Group Inc. (GS), which owns a stake in the largest cargo-terminal operator. " @Jerry: Yeah, I just read that. And then there's this from CNN. "The ILWU -- which represents 15,000 dockworkers -- has distanced itself from the protest movement. The union "shares the Occupy movement's concerns about the future of the middle class and corporate abuses," ILWU President Robert McEllrath wrote to locals last week -- but he urged the movement to stay out of its dispute with the port of Longview, Washington, and warned against "outside groups attempting to co-opt our struggle in order to advance a broader agenda." I also just read another about clashes between the protesters and the workers but will have to go back and look for it. God knows where I saw it. Jerry, I'm not sure I consider making it so people don't get paid a mere inconvenience, especially when they don't get paid worth a damn to begin with. @Jerry: Found it - from Mother Jones. 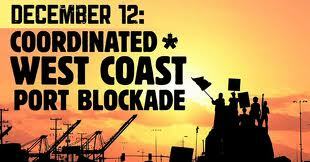 "In Oakland, Occupy protesters exchanged heated words with angry port workers who were anxious to be paid. Among these workers were members of the International Longshore and Warehouse Union (ILWU), whose leadership had spoken out in opposition to the shutdown." The 1% want to keep the workers poor, hungry, and insecure. Poor, hungry, and insecure workers are more afraid of losing their jobs than they are of losing their rights. All strikes involve financial hardship for the strikers. But in the long run, a successful strike benefits all workers. @Jerry: True to a certain degree but is this something the Occupiers need to be engaged in? Are they doing more harm than good, not only to the Occupy movement but to the workers in this case? It's real easy for us who have a steady income, whether it's from SS, savings or whatever, to say financial hardship is a necessity when we don't have people at home depending on us to bring home the bacon. There are no easy answers, I think. Here's an interesting but brief little piece I found on The Meadow Blog this morning. "Judging from the local paper in Portland, Oregon, I'd say the Occupy movement lost a PR round yesterday. The Oregonian reports that Occupiers made a "target" of a relatively small family-owned company when it jammed the Port of Portland. One trucker told the paper, "Everybody's got their right to protest -- I just won't get paid if I can't pick up the load. I'm just a guy trying to make a living." You could kind of see this coming. The local alt-weekly, the mighty Willamette Week, previewed the occupation with this from the Longshore and Warehouse local. "If I wanted to shut down the port, I could do it without Occupy. I don't need 'em," says Jeff Smith, president of ILWU's Columbia River District Council. "This is a question for the Occupy movement: Why would I want to send my people home? Why would I take a job away from somebody? "I don't get what they're thinking. It's my job to put people to work. I've got jobs for 'em, so I'm going to put 'em to work. And I'm going to take some of Wall Street's money." Dave Weigel writes that maybe Occupy will drag the labor movement into asking for more. As Melissa Harris-Perry said on the show last night, it's complicated. And it's way not over. Great post, Leslie, and real service to readers of all stripes. I love it that you update off a wire, as the story unfolded. Just like the old days. The port idea seemed screwy to me from the get-go in Oakland a month or so ago, and it's disheartening that they haven't given up this wrong-head tactic. The most important aspect of a protest movement is to build a base of fans, until you have enough people to create a mass movement to facilitate change. Do something stupid and you don't add to your fan base, but may lose some of the fans you already have. Guess they haven't figured this out yet. @Paula. Thanks and I agree with you about the possibility of losing some of your base support. Once that happens, they just may never come back. I still think it's a mistake but others here have made some good points as well. It all might boil down to a "time will tell" moment. JTC, the workers and their union have made it clear that they don't want these clueless, bullying assholes to get involved. Again, what these idiots were doing here was not in any way a protest against, or inconvenience to, the 1% parasite class. It was purely harassment of working-class people. They are attacking the people they claim to speak for, and that's all they're doing. @Infidel: If one reads the full text of the letter from the Coalition for Clean and Safe Ports, they're basically saying "thanks but no thanks" - not a ringing endorsement exactly. Hard won labour victories came with some discomfort to ordinary workers, businesses and the public. The 1886 Chicago General Strike is a case in point, in which workers demonstrated for the universal acceptance of the 8-hour day. They paid the price in blood, as did the overly-zealous police sent to disperse them. Our history of labour and civil rights is one of organized protest in the face of public discomfort, acquiescence and apathy. Sorry port workers. You're a part of the problem, too. @Gerald: A big difference I think you're overlooking is that the workers and civil rights activists in the past made the choice themselves; it wasn't fostered upon them by some outside source, as it was in this case. A prominent example would be the Montgomery bus boycott which lasted a year. Saying the port workers are part of the problem smacks of the old Eldreidge Cleaver quote, "if you're not part of the solution, you're part of the problem" - a false dichotomy/choice that leaves no room for the middle ground and one I've never subscribed to. No way can the port workers be seen as part of the problem. As for the others, I support their right to say t hat the ports are bad. But if they harass people (a form of violence), trespass (criminal activity), or block free movement (a milder form of violence, but still a form of it), they deserve no respect. In addition to regular wages, they may have lost more that. When I was a Communications Workers member, we had to work the day before and the day after a holiday in order to collect our holiday pay and I know other union contracts stipulated the same. I agree in principle with Occupy movement but keeping laborers from their jobs is wrong in this ugly economy. "Oh, darkies how my heart grows weary"
ANONYMOUS COMMENTS WILL NOT BE POSTED. If you have trouble signing on or leaving a comment, please email me. Regardless of viewpoint, we love to get your feedback. Reluctantly, moderation has been enabled. Hang tight and have patience, my friends. Alan Singer: Does TFA Stand for Totally Fraudulent Assessment? What the hell's going on here?